Happy New Year! Let me start off 2015 by posting a review for a brand that I have been meaning to blog about for ages: Alter Eco. I have draft reviews for 2 other Alter Eco bars (aside from this one) that I haven't gotten around to posting, so it's about time! Alter Eco has just about every fair trade/organic certification I've ever seen, but that's all I'll say on that. What I am qualified to comment on is the fact that every darn bar of theirs that I've tried is pretty delicious. This is the Dark Coconut Toffee bar, but I hope to post about the Dark Quinoa and Dark Salted Brown Butter bars soon, too. If I can find my notes, I'll add the Dark Velvet, too! Full disclosure: in my notes, I treated this like a milk chocolate bar. Oops. 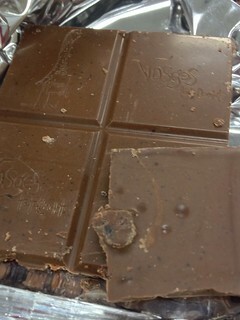 But I definitely prefer this sort of barely dark bar to milk chocolate, and I wouldn't want it to be any "lighter." The bar smelled like cocoa and nuts rather than coconut. The chocolate was slightly bitter and not sticky, nor overly sweet. Much like the aroma, the coconut flavor was subtle, so I wouldn't write it off if you’re lukewarm on coconut. Like the chocolate, the toffee was bittersweet, especially at first, giving way to a caramel flavor. Combined, the flavors reminded me of the Samoa Girl Scout cookies, only not as sweet. 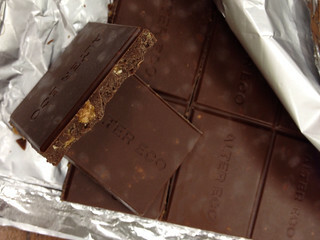 The bar had a crunchy texture that was reminiscent of sugar, especially the kind with larger crystals. 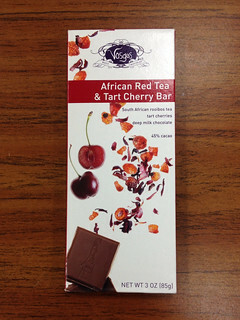 The flavors and textures were well-balanced, but I wouldn't call this bar a new favorite. 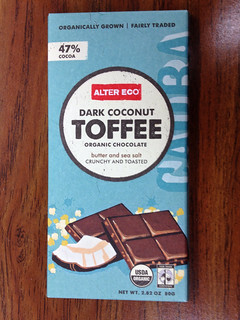 As I stated above, Alter Eco makes some excellent chocolate bars, and this one was good – just not top tier.